We got up early so that we could get in line at Anacortes for an 11 am ferry to Friday Harbor. The San Juans greeted us with typical gray skies, but displayed their charm non-the-less. Arriving in Friday Harbor, we had fried seafood lunch and browsed the town before checking out our cabin. Westcott Woods cabin is a very unique rustic structure nestled in the woods above Westcott Bay. 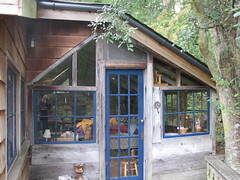 The original cabin was constructed in the 70’s with recycled lumber. Some newer additions attempt to maintain the rustic theme. The bookshelves are filled with classic literature, which made our literary fans happy. The evening was spent enjoying the surroundings and cozy cabin.